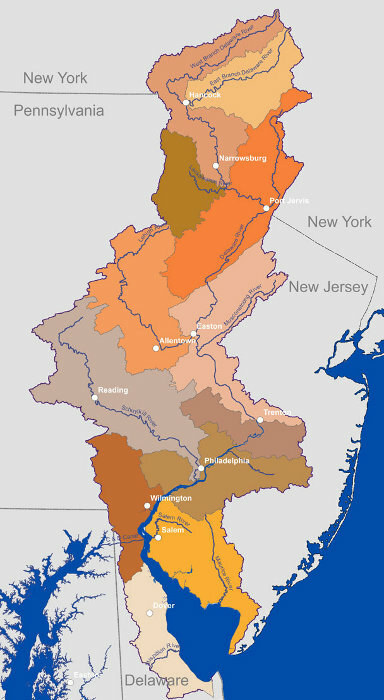 What makes the Delaware River Basin special? Lying in the densely populated corridor of the northeastern US, the 13,600 square mile Delaware River basin stretches approximately 330 miles from headwaters in New York State to its confluence with the Atlantic Ocean. The basin includes approximately 12,800 square miles of land area, nearly 800 square miles of Bay and over 2,000 tributaries, including many that are rivers in their own right. The Delaware River’s condition is very much a product of the cumulative flows from its many tributaries, which in turn take their character from the underlying geology, topography, microclimates and land uses of their watersheds. The northernmost tributaries to the Delaware River originate in the forested western slopes of the Catskill Mountains that reach elevations of up to 4,000 feet. The East and West Branches meet at Hancock, New York where the Delaware River officially begins. The River descends about 800 feet on its journey to the sea. The drainage area encompasses extensive landscapes in New York, New Jersey, Pennsylvania and Delaware. All or portions of 42 counties and 838 municipalities within four states contribute to and benefit from the resources of the Delaware River Basin. Water resources are also exported to cities in NJ and NY outside of the Basin boundary. The Lower Delaware National Wild and Scenic River includes a 38.9-mile section of the main stem Delaware (and about 28 miles of selected tributaries) linking the Delaware Water Gap and Washington Crossing, Pa., just upstream of Trenton, N.J. Three-quarters of the non-tidal Delaware River is now included in the national system. On average over 8.7 billion gallons of Delaware basin water are put to use each day. These numbers include an average of 736 million gallons of water exported for populations in New York City and northeastern New Jersey, which account for approximately 8% of the total amount of water withdrawals. Overall, 90% of all water withdrawn from the Delaware basin is diverted from surface water flows. Potable water in the basin is supplied from surface water diversions (64%) and ground water withdrawals (36%). Nearly 90% of all potable supply for commercial and residential use is through public water supply systems; only 10% is from domestic (household) wells. The basin average for consumptive loss in public water distribution systems is approximately 10%. The salt line is an estimation of where the seven-day average chloride concentration equals 250 ppm along the tidal Delaware River. The salt line location plays an important role in the Delaware River Basin water quality and drought management programs because upstream migration of brackish water from the Delaware Bay during low-flow and drought conditions could increase sodium chloride concentrations in public water supplies, presenting a public health concern. 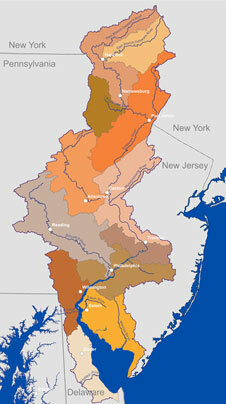 Courtesy Delaware River Basin Commission State of the Basin Report 2008. Philadelphia and its international seaport activity generates jobs, labor income, economic output and tax revenues. Delaware River ports employ 4,056 workers who earn $326 million and generate $1.3 billion in economic output. Approximately 65 percent of the region’s cargo tonnage is in petroleum. The region also specializes in niche cargoes such as steel, wood products, and perishable items such as fresh fruit, nuts, cocoa beans and meat products. Delaware River ports import nearly half of the nation’s cocoa beans, almost a third of the bananas, and a quarter of all fruit and nuts. Courtesy Economy League of Greater Philadelphia Maritime Commerce in Greater Philadelphia July 2008. The Port of Philadelphia was named the nation’s 14th Strategic Military Port by the U.S. Department of Defense in 2002, making it one of only 14 ports in the United States permitted to handle the nation’s military cargoes destined for various points around the globe. Courtesy Philadelphia Regional Port Authority. The river also played an important role in our nation’s history. General George Washington and men of the Continental Army and militia crossed the Delaware River in 1776 and marched to Trenton, New Jersey. This surprise attach and victory set the stage for Washington’s subsequent victories at the Second battle of Trenton and Princeton. The crossing and the Trenton/Princeton campaign have become known as the Ten Crucial Days, a campaign that saved Washington’s army from defeat, allowing them to fight another day and achieve ultimate victory. Courtesy Washington Crossing Historic Park.